Cruelly abandoned by her hipster master who felt that taking care of her was too much of a burden, Hazel was forced to shed her dignity and was reduced to selling eggs and playing music on the street for strangers in hope of securing her next meal. It all began several years ago with the troubling news that chickens and roosters were arriving in unprecedented numbers at animal shelters and sanctuaries throughout the United States and Canada. Recently, things reached a point where facility overcrowding is resulting in many of them being turned away due to lack of space. The authorities were puzzled at first as the phenomenon was widespread and largely precluded the possibility of a mass breakout at a local Perdue or Tyson facility. One local reporter even made a phone call to a well-placed retired colonel who is knowledgeable about the poultry industry. Unfortunately, this didn’t shed any further light on the mystery, as the polite southern gentleman pronounced that ”business was as finger-lickin’good as ever” with no reported shortages of raw materials. A few clues eventually began to surface in the mainstream media. A recent Time Magazine article discussed the roots of the chicken abandonment problem and quoted the owner of The Chicken Run Rescue facility in Minneapolis as stating: “It’s the stupid foodies” and “We’re just sick to death of it.” Another animal rescue group in Seattle, Ducks and Clucks, told The Daily Caller that “hipster urban yuppie types who entertained romanticized notions of raising farm animals” were to blame for the crisis. This led animal rights activists to proceed to conduct surveillance at several of the more prominent shelters to see if they could identify the method of transportation used to deliver the chickens. Soon, a pattern was revealed in the shadowy arrival of abandoned chickens. As had been suspected earlier by the reporters, they were being dropped off by people who appeared to fit the pattern of hipsterism, either by their garb, hair, demeanor or mode of conveyance. The chickens were seen to arrive transported in Kånken backpacks, in handlebar baskets on single-speed bicycles, in the trunks of flashy hybrids and in one instance, a dilapidated VW bus was observed to disgorge several dozen chickens before speeding down a dimly lit alley into the night. It was now becoming clear that the unfortunate fowl were casualties of a dysfunctional locavore movement. The thought of stimulating production of healthy organic food in local communities was attractive to hipsters and it was a well-intentioned effort that initially enjoyed success as bumper crops of homegrown tomatoes, lettuce, zucchini, beans and other tasty summer staples flourished. Chicken coops soon followed as the hipsters moved on to focus on fresh egg production. At first, everything went well for the chickens. 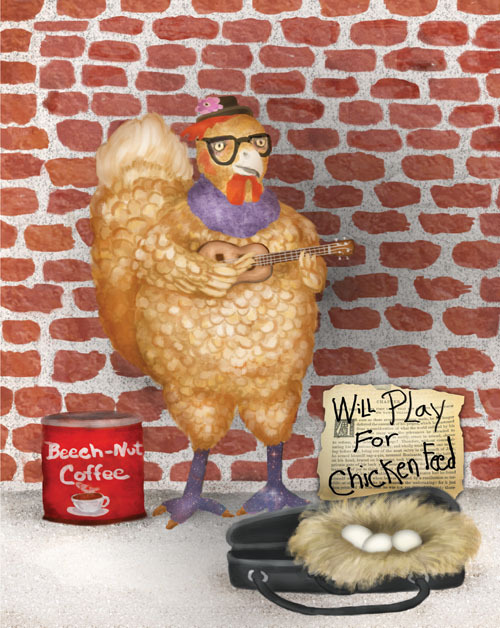 During the course of their tenure in their comfortable urban settings, the chickens began to emulate their masters by dressing in ragged retro clothes, donning Kangol berets, wearing lenseless tortoiseshell glasses and surreptitiously learning how to play the hipsters’ musical instruments. They even went as far as sneaking sips from their owners’ unattended cans of Pabst Blue Ribbon beer, all the while secretly cackling out old Pabst marketing slogans, such as “Pabst makes it perfect.” Oblivious to their eventual fate, the flocks reveled in tipple and song with only passing concern regarding what the future might hold for them. Everything went splendidly for a while as hipsters, enthralled with pets that also produced breakfast, proceeded to purchase wholesale quantities of cute fuzzy little chicks. The fact that some might grow up to be roosters never crossed the hipsters’ minds. But as nature would have it, half of the hatchlings turned out to be roosters that were not only incapable of laying eggs, but also soon became an annoyance to entire neighborhoods with their early morning crowing. The hipster foodies were placed under increasing pressure by the communities to do something about the pre-dawn cacophony. This led some people to suggest that this was a major contributing factor to a spike in the downloading of Julia Child’s iconic recipe for Coq au Vin off the Internet. Hazel was ultimately dumped on a street corner in a bad part of town and left to fend for herself. Later, she and a handful of surviving friends would recount harrowing tales about the fate of roosters who failed to live up to the foodies’ expectations regarding egg production. Husbands disappeared mysteriously in the middle of the night, and hipsters were said to have persuaded some of the recent arrivals to join a mysterious religious cult they referred to as the “The Order of Young Friars,” after which time they were never seen again. Hazel was fortunate in that she was able to grab her master’s ukulele as she was about to be spirited away in a rusty Volvo station wagon with a bad muffler. Now, she performs on street corners hoping to entice passersby to toss a little chicken feed her way.